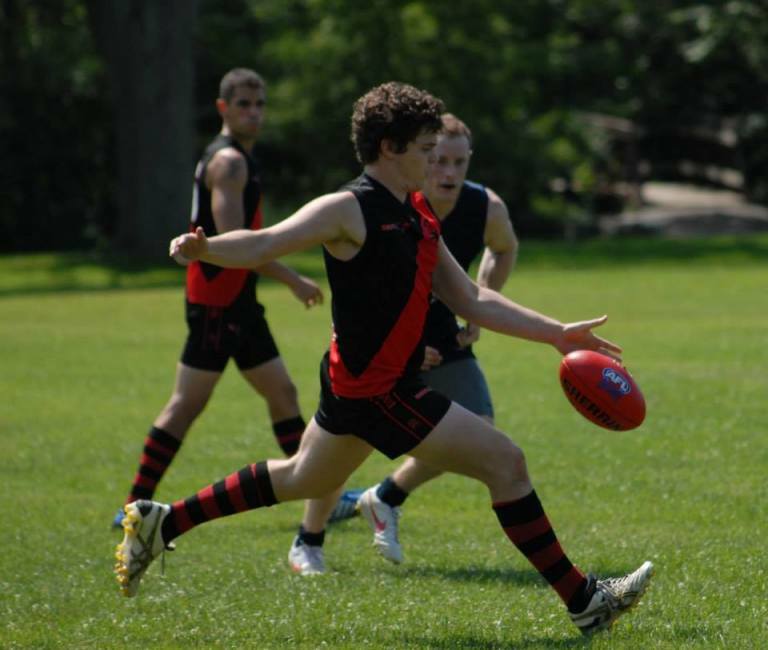 The Toronto Dingos Football Club has qualified two teams for the OAFL 2013 finals series. While the Div.1 team is still waiting on one more result to learn where they will finish, Div.2 completed an undefeated season with a hard fought 7-pt win over the Demons earlier this week. Both teams will play finals. Div.1 started the season strong with three solid wins against Guelph, Hawks, Swans and a draw against the Roos. This was followed by two losses against the Rebels and Eagles by 16-pts and 3-pts respectively. At that point their record stood at: 3W 2L 1D [six matches played]. The boys then went about correcting their flailing season with five wins on the trot, only to end the regular season with a big loss to the Demons by 54-pts. Div.1 will now face either the Hawks in dead rubber, or Guelph in an elimination final. Div.2 had a charmed run all season. It wasn’t all easy though. They started the year with two close wins against the Demons [16pts] and last year’s premiers the Hawks [22pts]. Both games could have gone either way. Next up they handed the Rebels [51pts] and the Blues [52pts] consecutive thumping defeats. After a rained out week against the Demons, Div.2 again lined up against the Blues and Rebels that produced mixed results. The Rebels match was a lot closer this time round, with Div.2 pulling through with a scrappy 15-pt win. The Blues game was a belting. Div.2 kicked 17 goals for the match and galloped to a 90-pt win. Div.2 played the Demons twice more. Both wins. One by 63-pts, the other was by 7-pts this week. Completing an undefeated season at any level is a terrific feat, one that needs a bit of luck and a committed team. Led by captain Alvin Ranchhod all season, the Div.2 boys never looked like losing a game and always seem to have the answers when challenged. Div.2 had an average winning margin of 39.5 for the season; their percentage finished at 277.53 [130 more than second place]; and they finished four games clear of their next opponent. Both teams now prepare for a finals series.